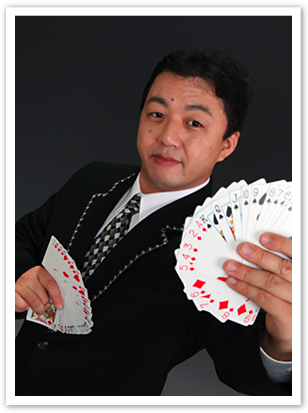 Magician "ISHI,Yutaka" is a full member of the Public Interest Incorporated Orchestra Japan magic Association, is a rare misdirection artists in Japan. The most good at the close-up magic to show off in front of an audience of the eye, also has worked as a magic advisor such as early amusement park a TV program. In addition, a wealth of knowledge and repertoire, the ancient and magic "Tezuma" Japan, also mastering the skill of ancient in Europe "pick pocket"! Art fingertips with just beyond the magic of the band to master the skillful misdirection, please enjoy the magic of the master misdirection artists that has not been seen until now! Until towards the table Magic greeting (table magic, etc.) • 300 people about is you can see, stage magic show Kids Magic Show Magic Workshop Magic classroom Magic guidance Magic Advisor original production, etc. of magic tool!